We are happy though to note that there are 16 individuals who got hired through the ads and 14 who were able to helped perhaps their friend/classmates to get job and employers to hire at least 9 from the job ads. Of course we also note that 1 respondent got scammed. Over-all we are satisfied that in one way or the other the group is able to be of help both to job and employee seekers. We will continue to moderate the job posts so that we can maintain the focus of the group - jobs related to Psychometricians and Psychologists. For those posting jobs we would like to request them to be truthful, honest and transparent - post the nature of the job, requirements, valid contact details and information, company profile or link/website/FB page of the company so interested applicant has a way to check the company. Again our warning to those who will respond to the job ads to always double check the veracity/authenticity of the posts and the company postings for the job ads, our DISCLAIMER - we are just sharing the posts, it is the applicants responsibility to check and double check the company. 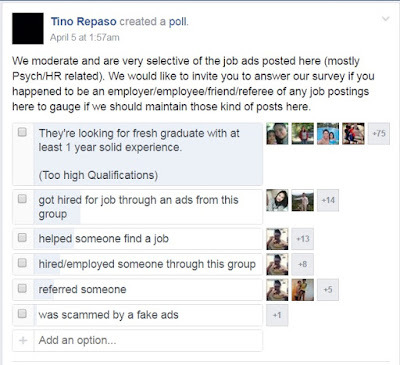 Also report to us misrepresentations and other malicious and deceitful job ads posts so we can ban those posters.